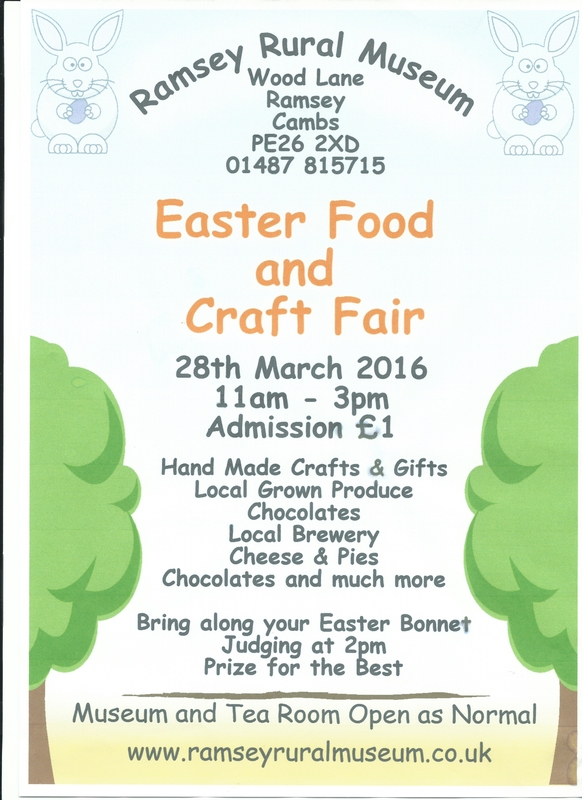 The Ramsey Rural Museum is holding a Food Fair on Easter Monday (28th March 2016) as the opening event of their season. It will be open to the public from 11.00am to 3.00pm and the site will be available to stall holders from 8.30. We will bring together the best local suppliers and producers to allow the people of Ramsey and the surrounding areas to experience the best of food. This follows successful similar events at Easter and the end of the 2015 season. It will be housed in our Historic Barn for small stalls (one or two 6 x 2 ft tables). In addition, there will be provision for your own gazebo in the adjacent courtyard to provide an outdoor market place. Applications that cannot be accommodated in the barn and stallholders that do not have their own Gazebo will be housed in an adjacent marquee. The site has adequate parking. I hope that you will be able to join us for this event. If you would like further information please do not hesitate to contact me by e-mail or telephone as detailed above.